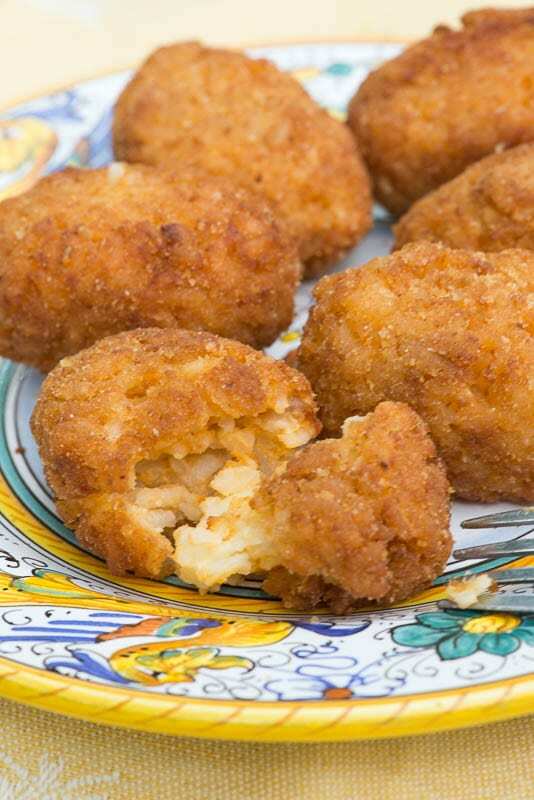 Supplì —deep fried rice croquettes—are a classic Roman antipasto. Along with olive ascolane (meat stuffed olives), they are a fixture on pizzeria menus all over town, a little something to nibble on while you wait for your pizza. Supplì are obviously very close cousins—more like siblings, really—of Sicilican arancini, but while arancini are round rice balls, supplì are generally made into oblong croquettes. The rice for supplì is prepared a bit differently, usually simmered in tomato sauce, while the rice for arancini are boiled in water and scented with saffron. And the filling differs, too: supplì are most often filled with bits of mozzarella, while arancini are generally filled with meat. Personally, I’m on the fence when it comes to supplì. I generally find the tomato flavor too strong, so for this personalized version, I cook the rice in broth, with just a hint of tomato provided by a spoonful of tomato paste. In a large braised or sauté pan, sauté the sliced onion in butter until it is soft and translucent, making sure it does not brown. Season with salt. Add the rice and sauté that until it has turned a chalky white, then add a splash of wine and let it evaporate. When the rice has cooled, take up a handful in the palm of you hand, flatten it out a bit, and in the middle place a cube of mozzarella (or whatever other stuffing you are using—see Notes below). Close the rice around the stuffing, press it together firmly with your hand and, now using both hands, form the rice into a slightly oval croquette. Deep fry the croquettes in abundant oil until they are nice and golden brown all over, about 5 minutes or so. The oil should not be too hot—say, about 160C/320F—so it won’t brown too quickly on the outside before the supplì have had the chance to cook on the inside. Serve your supplì while they’re still nice and hot. As mentioned, classic Roman supplì are made in rosso, whereby the rice is cooked with a meat-based tomato sauce—the sauce from a garofolato would be a great choice—rather than broth. Just substitute the sauce, thinned out a bit with water so it won’t burn while simmering with the rice, for the broth given in the recipe above. The rice, as mentioned, should be quite tender, not al dente, so they stick together to form a croquette. While perhaps the most classic stuffing for supplì is mozzarella cheese, there are other possibilities, like mixing mozzarella with little bits of prosciutto, chicken livers roughly chopped and sautéed in olive oil with a bit of garlic and sage, perhaps with some reconstituted dried mushrooms thrown in. Supplì can also be filled as you would arancini, with a spoonful of a thick sugo di carne (meat sauce), perhaps with some peas mixed in, but then, if you ask me, they are arancini, not supplì! Like most fried foods, supplì taste best when you eat them fresh from the fryer, but they are not bad when eaten at room temperature. They can also be made ahead and gently reheated in the oven; the mozzarella won’t be as creamy (often it just melts into the rice during the reheating) but the flavors will still be quite nice. Deep fry the croquettes in abundant oil until they are nice and golden brown all over, about 5 minutes or so. The oil should not be too hot—say, about 160C/320F—so it won't brown too quickly on the outside before the supplì have had the chance to cook on the inside. Serve your supplì while they're still nice and hot. Thanks, this was just the recipe I was looking for. By the way, when in Rome I was told the “al telefono” was in reference to telephone wires, the ones that go from pole to pole, on the street, still to be seen nowadays. I am looking for a Anancini al Sugo (Silicia) recipe similar to what the restaurant Il Fornaio has for August 16 in their special menu. Thanks for your comment, Ray. I don’t have an arancini recipe up yet on the blog, but will definitely get to it one of these days! Frank: While I’m at it, Il Fornaio also had a wonderful Timballo di Capellini con Melanzane, also Sicilian which was delicious. I search, and find many recipes that in translated Italian still leave questions. Your site is exquisite in recipes, pictures and taste for those that I have downloaded and tried. Mille grazie. Do you have a recipe for Arancini al Sugo? This month (August 2016) the restaurant Il Fornaio is featuring them on its Sicilia special menu. the arancini are rather creamy, even if mine did not turn out as creamy as the ones you can see in the Seriouseats picture. Next time I will add more béchamel sauce. The gelatine rich stock delivers a good body and the water/flour paste you roll the arancini prior to bread-crumbing them seemed to contribute to a super crisp finish / I thin it is worth adopting it. As for the sushi rice it is called for … not sure it makes a big difference. I would stick to an Italian rice, cheaper and easier to find. HI, I was wondering if you can recommend some great cafes and restaurants that are kid friendly. We are staying near the Spanish Steps so anything close to there would be wonderful as well. Generally speaking, most places in Rome are quite kid-friendly. But these days I’ve lost touch with the restaurant scene, so I hesitate to give specific recs. You should check out two excellent Rome-based bloggers: Elizabeth Minchilli and Katie Parla. They won’t steer you wrong! Sono d’accordo con Chiara: mangiati caldi caldi sono il massimo. When my mother made them (and also crocchette di patate), she had to lock the kitchen door to keep us all out, especially my father. + I see now yr post, Frank …perhaps it is high time I went back to them …. Have you tried his recipe for arancini yet? I wonder if it doesn’t change the character of the dish, perhaps in a good way… I especially like the baked rice idea—I’m a real sucker for anything grantinéed with béchamel. Thanks for the tip, Stefano! Hah! Loved your last sentence… so true! I am usually more of an arancini fan myself, but who can resist a string of warm, gooey cheese? We have a land-line phone…so one of those curly cords! OK…we do have a few cordless too! I’m like Diane…the cheese inside is enough for us too and I do like using left over risotto…but, that said will be trying the tomato flavoured rice…cause in my books everything is better with tomatoes! Having eaten arancini in Tuscany last year…I decided it was time to make some when I got home. I don’t particularly care for the meat inside, so I used mozzarella and saffron rice…they were wonderful! So…as we are going to Rome in the fall…methinks it’s time I made suppli…no meat though…like your idea better! Once our kitchen reno is done will make some! BTW made your cippolline agro dolce last week…liked them a lot and very, very easy to do! sono buonissimi e , anche se si rischia di scottarsi, bisogna mangiarli caldi caldi ! Buon we Frank ! I’m with you on the tomato sauce addition. I prefer it without and with lots of mozzarella. I wish I were eating a few of these tonight. I don’t know these at all – but this would be a tasty addition to the antipasti plate. I like the idea of little-to-no tomatoes. Phone cords. Still have them. Wow, I didn’t know anyone still have cord phones!